Load your Shoppers Drug Mart coupons this week! We spotted a hot coupon! 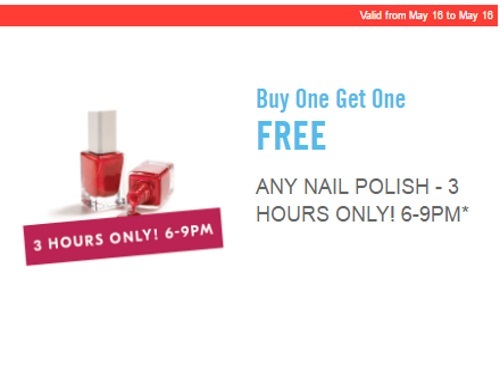 Get BOGO on nail polishes on May 16 between 6-9pm! When you buy 1 nail polish you can get 1 Free! This was an exclusive coupon that I personally had in Optimum account, I am not sure if it applies to everyone, but it's worth trying. Click here to load your Shoppers Drug Mart coupons.